These two letters were written by George Haskell Lawrence (1834-1906), a cordwainer, and the son of Nathan Lawrence (1798-1868) and Elizabeth (Betsy) Shattuck (1808-1888) of Pepperell, Middlesex County, Massachusetts. George wrote the letter to his older brother, Nathan Augustus Lawrence (1830-1914). He mentions a younger brother, Abel Shattuck Lawrence (1846-1905) in the letter. George married Betsey B. Page (1842-1915) in December 1868. George wrote both letters while serving in Co. B, 26th Massachusetts Infantry. He was mustered into the service in October 1861 and was discharged for disability at New Orleans in December 1863. I received your letter day before yesterday and was very happy to hear from you and to hear that all of you were well. I am tough as a bear. My health never was so good as it is now. We came here day before yesterday. We are quartered in Odd Fellows Hall and Lafayette Square. It is a very pretty place here in the city but the boys are not very smart. There is 20 that is not able to do duty in our company. I am in rather a hard place — head cook — and I have lots of work to do but we have got a darky to do the hard work. But I don’t know how long he will stay. There is lots of poor people here. They come a begging every day. We could live first rate if we had a plenty of money but we haint been paid for 5 months and we shall not be paid for some time yet. When I get time, I am a going to get my picture taken and send it to you so you can see how I am looking and I am a going to send some more things home for I can’t carry them with me. Henry Wood ¹ and I shall send a box together so you will have time to go over to his house after the things. I will let you know when I send them. I don’t know any news to write to you. It is a tough place here. One of the soldiers was shot night before last as he was walking on the street. It is not safe to be on the street after dark. I don’t like to be in the city at all. I am not afraid thought everything is high. Wood [is] 14 dollars a cord, milk 10 cents a quart, a broom costs 50 cents. We get figs here before they are pressed. They are funny tasting things. I wish you had some of them. Now, I want you should keep my gun from rusting and that one up to Aunt Silva’s and look after my other things. Now be sure and do it. Give my respects to all enquiring friends if I have any. But I guess there is not many in Pepperell. But I don’t care. I can take care of No. 1, I guess, for I have enemies wherever I be. It is dreadful warm here but there is not many mosquitoes here as there was down to the fort. We hear good news that Richmond is taken. I hope it is so. Sometimes I think that we shall have to stay our three years but that don’t trouble me any at all. One of our regiment died to day. That makes 24 that has died since we left Ship Island. There is 4 regiments in the city and one artillery and a company of cavalry which Horatio Wright is in. I saw him yesterday. He looks first rate. 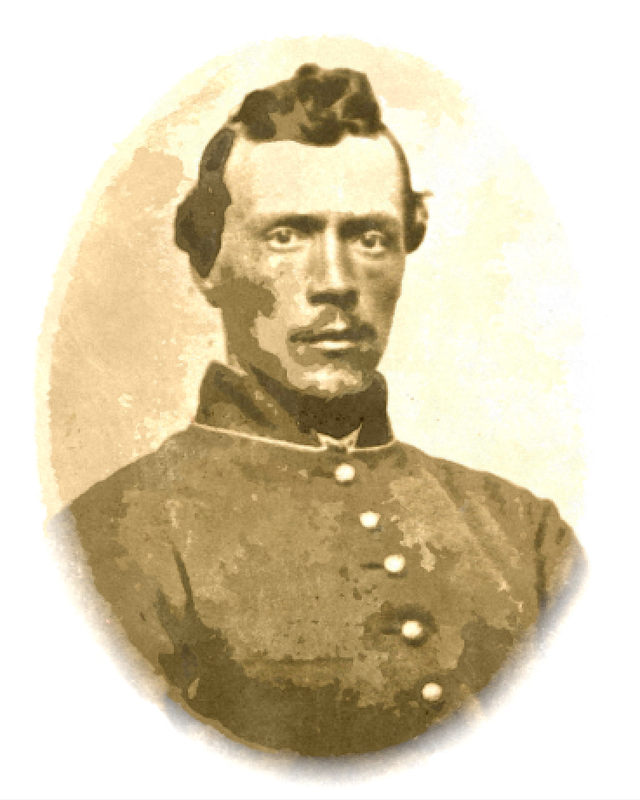 ¹ Henry Wood served in Co. B, 26th Massachusetts with George. Henry was a 32 year-old carpenter in Pepperell when he enlisted. I now answer your letter of September 8th. I received your letter last night and was glad to hear from you and to hear all of you were well. My health is about the same. I have a bad diarrhea and don’t feel very smart. There is not any use of going to the doctor for he don’t know anything. But enough of this. I expect we shall go from here in a day or so. The Pierce boys can tell you how it looks here. We tear down the houses and burn them up. There was 2 Divisions went from here yesterday. I expect our destination is Texas. It is cold. Night before last it was so cold I could not sleep. Last night it was not quite as cold. And we can’t get half enough to eat. I am glad I am out of the cook house. We have to steal stuff to get enough to eat and don’t get enough at that. It is hard to fight for one’s country and be starved, but such is war and I am very glad you are not in it. If Bill Chapman could see our regiment now, he would not think us gentlemen for we look like niggers — all black with tan. About that gun, you tell Aunt Sylvia to keep it until I come back or until you hear I am dead, for if I live, I want it. Anyway, I don’t care what the price is, so she may consider it mine for I will give her more than anyone else so she can say it is sold. I would send her the money for it but I have not but 4 dollars and I don’t know when I shall get any more. When they settle this year’s clothing bill, I can send it, and I don’t know when that will be. I am much obliged to you for sending the envelope for we can’t get any here nor we can’t buy anything at all. Does Father have any trouble about getting my allotment? Some of the boys’ folks can’t get it. I don’t think of much more to write. I dreamed of seeing Fred last night and of being at home picking walnuts. Is there a going to be many this year? The Pepperell boys are all well but Charles Williams. ² He is at New Orleans. I don’t know when I shall have a chance to write to you again. You need not be worried if you don’t hear from me for a long while. I should like to get something good to eat but I can’t. Give my love to Father and Mother and [brother] Abel. I send love to you all and are glad you don’t have the cold, damp ground for a bed. Now I will close by bidding you all goodbye for the present, hoping these few lines will find you well. Excuse bad writing for I have to write on my cartridge box. I will write again when I have a chance. Oh how I want to see all of you. ¹ Sabine Pass Texas Expedition, September 4-11. At Algiers until September 16. Moved to Brashear City and Berwick City September 16, and to Camp Bisland September 23, 1862. ² Charles Williams — Priv. — Res. Pepperell ; 42 ; farmer ; enl. Sept. 9, 1861 ; must. Oct. 18, 1861 prom. Corpl., Nov. 1, 1861; re-enlist. Feb. 1, 1864; wounded Sept. 19, 1864, Winchester, Va. ; must, out Aug. 26, 1865.